Editor's note: This column was co-authored by Andrew Shirley, a Citizens for the Republic contributor. When President Ronald Reagan, 30 years ago today, gave one of the most iconic speeches in modern history, the media all but ignored it. The speech went largely unnoticed and unremarked upon in America, but not in the Soviet Union. It was that his call for then Soviet Leader Mikhail S. Gorbachev to “tear down this wall,” was so alarming to the Communist States that the Soviet Press agency, Tass called it an “openly provocative, war-mongering speech.” Former West German Chancellor Helmut Kohl considered the moment so powerful that he would “never forget it.” Even with 30 years of distance and analysis, we still have much to learn from that cold day in Berlin. As far as the media was concerned, Gorbachev, not Reagan was the true champion of peace. Reagan was a “diminished figure,” marred in the scandal of Iran-Contra. In the media, where Reagan was considered old and out the door, Gorbachev was the young reformer who would lead the world to peace. In fact, The New York Times was so dismissive to the true substance of the speech that the headline they gave their coverage of it was; “Raze Berlin Wall, Reagan Urges Soviet.” Hardly Reagan’s intent. While it didn’t single handedly end the war, it underscored one of Reagan’s most overlooked principles. 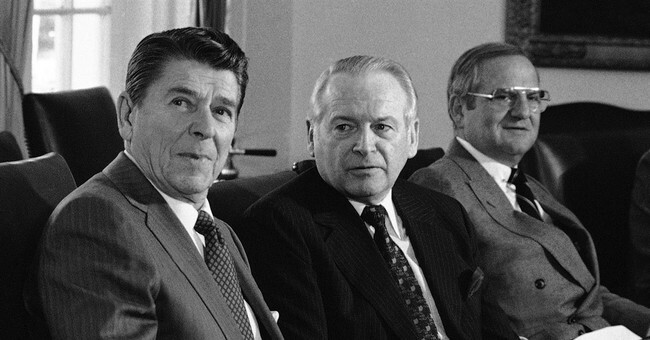 In the eight years of Reagan’s presidency, three Soviet Leaders had died. Gorbachev was the fourth leader in eight years that Reagan had to build a relationship with. He once remarked to his wife; “How am I supposed to get anyplace with the Russians if they keep dying on me.” Their transient nature reinforced the Great Communicator’s deep rooted philosophy that it is great action, not great rhetoric that truly matters. He had head time with one leader after another bandying about talks of peace and reform, but these talks often fell short of real action. Even if Gorbachev was truly the one to implement these changes, who’s to say he would live long enough to implement them. That was the true heart of his speech at the Brandenburg Gate. If Gorbachev was truly the great reformer and champion of peace, then the time had come for him to act on his rhetoric. It was time for Gorbachev to tear down the wall. Today, 30 years on, in the age of social media and spin, Reagan’s commitment to action over rhetoric is quickly becoming an anachronism. That is exactly why I’ve joined Citizens for the Republic. Founded by Reagan himself, it was his hope that the organization would carry on his legacy and commitment to the principles of freedom and liberty. Too many of our elected leaders and officials rely on rhetoric and narrative to cover up for a failure to act. We should echo the rhetoric of Reagan, but it is his actions that we should truly seek to emulate. It is these actions that Citizens for the Republic will emulate.